Property 1: Dog-friendly studio in quiet location - shared hot tub, great outdoor adventure! Property 3: New fixtures & convenient amenities create a great home base for outdoor fun! Property 4: Stunning Tiny Park Model Homes Brand New!!! Property 11: Modern desert retreat w/ gorgeous mountain views & private hiking trails! Property 12: Stunning Tiny Park Model Homes!!! Property 13: Dog-friendly home w/shared hot tub in quiet neighborhood - 14 miles to Arches! Property 16: Single-level home w/ beautiful surroundings, close to Arches! Two King Size Beds! Room for all your toys!! Lots of parking!!! Property 22: Two King Size Beds! Room for all your toys!! Lots of parking!!! Custom-built home with private hot tub & sun deck - great for stargazing! Property 23: Custom-built home with private hot tub & sun deck - great for stargazing! Moab Pearl Ecolodge - Rare October Opening! Property 24: Moab Pearl Ecolodge - Rare October Opening! 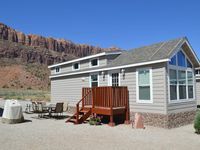 Property 26: 'Red Rock Rambler' 3BR Moab Home w/Hot Tub! Luxury home w/ spectacular views & hot tub - walk to the golf course! Property 34: Luxury home w/ spectacular views & hot tub - walk to the golf course! Property 36: Beautiful home with fun decor and everything you need in your home away! Beautiful dog-friendly home w/ shared indoor pool & modern comforts! Property 40: Beautiful dog-friendly home w/ shared indoor pool & modern comforts! Why Rent a Room When You Can Rent a Canyon? Property 41: Why Rent a Room When You Can Rent a Canyon? Stay in an Original Moab Farmhouse from the1930's! Property 43: Stay in an Original Moab Farmhouse from the1930's! Very nice house with lots of rules and additional fees. Very nice place, and close to Moab! Very nice tiny home. Everything that we needed was there. Comfortable and accommodating!